Tell us about Racha revenues? After watching preview of Racha, Chiranjeevi said that it will become a huge grosser. Tirupati Prasad called me at 5 am and informed me that Racha is a hit. VV Vinayak called me at 7 am and congratulated me. I had been getting positive response throughout. The total revenue of Racha is around 56 crores. You stayed with Gabbar Singh 2 project for a long time? What did Ravi Teja like in Bengal Tiger? He has liked the 5-minutes flashback episode, interval sequence and characterization. Why did you title the film as Bengal Tiger? People might interpret such kind of animal names to virility and bravery. But, it’s pretty different in the case of our movie. I have studies traits of tigers. Bengal Tiger is said to be the most intelligent animal. There are a few special characteristics of Bengal tiger which are incorporated in the characterization of Ravi Teja. 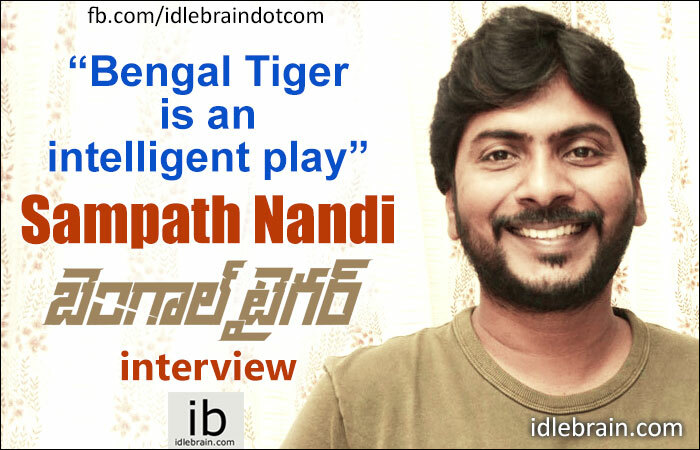 Once you watch the film, you will understand how Bengal tiger’s characteristics (attitude and decisions) are shown through the character of Ravi Teja in Bengal Tiger. Bengal Tiger is is about an intelligent play between protagonist (Ravi Teja) and antagonist (Boman Irani). It’s a conflict between two intelligent people. Tell us about making of Bengal Tiger? We have shot the film in Rajahmundry, Pollachi, Hyderabad and Europe (songs and montages). Initially, we planned the shoot for 110 days, but we wrapped it up in 100 days due to good planning and cooperation from the unit. I got a storyboard done for the movie which helped a lot during the making. The entire film is shot in the budget we planned for. Runtime of the film will be around 2 hours and 25 minutes. Tell us about main leads of Bengal Tiger? I didn’t have a much of interaction with Ravi Teja before Bengal Tiger. He saw Yemaindi Ee Vela and called me to congratulate. He like Bengal Tiger. It’s a story that suits his image and it enhances his strengths. He is a kind of hero who contributes to movie with his improvisation in dialogues and characterization. Bengal Tiger will offer a different entertainment characterization for Ravi Teja. Characters of Tamanna and Rashi Khanna take the story forward. The character of Tamanna needs an actress with big image. The character of Rashi Khanna needs a fresh actress. Both of them have done wonderful job. I wrote villain character by keeping Boman Irani in mind. When I tried to narrate story to him over phone, he insisted that I go to Mumbai and pitch the story personally. 20 minutes into narration, Boman Irani has accepted to work for Bengal Tiger. How is your relationship with Pawan Kalyan? My relationship with Pawan Kalyan and Sharath Marar is very healthy. I learnt a lot from Pawan Kalyan. I have matured as a human being with the conversations I had with him. My shotmaking skills are upgraded because of Pawan Kalyan. I am sure that you will see a lot of difference in my work in Bengal Tiger compared to my earlier film Racha. I am going to narrate a story for Pawan Kalyan for sure in near future. Did coming out of GS2 project upset you? Did the people around you reacted negatively to it? I would like to narrate an incident that happened in my life. I worked as a dialogue writer for a film titled Toss which had Upendra as hero. Upendra liked my work and took me to Bangalore to introduce me as director. I directed a film with Upendra (bilingual in Kannada and Telugu) with a budget of 6 crores. But the film was stalled after 95% of the shoot was over. I stayed in producer’s office in Bangalore for over 2 years after the film was stalled. I was looking at the fan and the TV set though out the day. All other teammates gave up and went away. I had to wait for 2 years in that office to abandon that film. My marriage was fixed with a girl I love. After coming to know that my film was not releasing, I had problems with the parents of the girl. I had to struggle for a couple more years and convince them. I had seen lows since I started my career as writer in film industry. Hence, I stopped giving importance to what others think about me. I just concentrate on my work and look forward for a better future and for more important films. Producer Radha Mohan has played a pivotal role for my film career! I was the dialogue writer for Toss which was produced by Radha Mohan. When I went to Maithrivanam area, I was fascinated by the atmosphere over there (banners and pamphlets of software training institutes, surrounded by hostels). I went to Radha Mohan with the idea of Maithrivanam. He is a corporate man with lot of humanity. He saw a decent human being and a good writer in me. He trusted me and produced the movie. When I got married and had very little money, he came to me and gave half of money he made through the sale of remake rights of Yemaindi ee vela. When I got an opportunity to direct Ravi Teja, the first producer that came to my mind was Radha Mohan. He has good working style and I want to see him as a big producer. Do you get inspired by films? Whatever I had written so far is my own and is original. I don’t take inspiration from other films to write mine. You have a good grip over dialogues? I read a lot of literature. I have worked as an assistant and as ghost writer for 25 films in a span of 3 years. I love reading autobiographies. I love writing and I am a constant learner. I have a script ready for a big star. Will give a narration soon!